Ciscoes have roughly the same amount of omega-3 fatty acids (EPA and DHA) as sockeye salmon. They can be used fresh, smoked and frozen; they can be steamed, fried, broiled and baked. Making ciscoes into fish cakes is a North Shore Scandinavian tradition. Ciscoes are harvested from Lake Superior with gill nets by both tribal and state-licensed commercial fishermen. Most of the ciscoes harvested during the non-spawning season are sold locally to restaurants, retail stores or directly to consumers. In October and November, when the bulk of the harvest occurs, supply exceeds local demand, so many ciscoes are sent out-of-state to be made into gefilte fish and the roe is made into caviar. Ciscoes can not be harvested in Lake Michigan and occur in very low numbers. 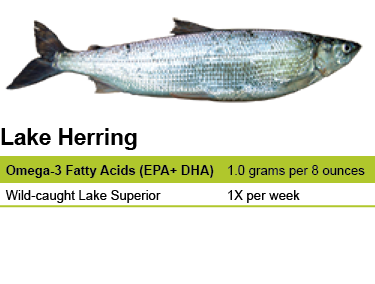 State health agencies have found that it is safe to eat Lake Superior cisco (lake herring) once a week. Ciscoes are commonly eaten by top predator fish including lake trout, burbot, northern pike, walleyes, salmon and others. They are long lived (up to 20 years) and can produce strong year classes from small adult stocks. Historically, the cisco has been the most productive commercial fishery in the Great Lakes, producing up to 19 million pounds annually from Lake Superior in the 1940s. However, due to overharvest and the introduction of nonnative rainbow smelt, populations plummeted. Since the smelt population collapsed in the late 1970s, ciscos have returned in abundance to Lake Superior. Cisco has been a key player in cook-offs sponsored by Minnesota and Wisconsin Sea Grant programs.